I’ve seen this tag knocking about for a while and thought it seemed like fun. I’m always intrigued to learn more about other people’s reading habits, favourite authors, beloved books and so on, so by all means take the mantle and answer the questions yourself; I’d love to see your responses. I do most of my reading at night, so I’m usually just perched on my bed. Bookmark. My favourite one has a picture of a cat on it. Obviously. It wouldn’t bother me what page or part of the book I was on but I could never stop reading half-way through a chapter. The thought alone makes me squirm. Not usually, since it tends to be late night (or early morning more specifically – yay for insomnia) when I’m reading. If and when I manage to do some reading during the day, I’d love a nice mug of tea by my side though. I prefer to read in complete silence. The joy of books for me is losing yourself in another world and music/TV would be too distracting. I wish I could read several books at once, since there is an endless list I want to get through, but I find myself so engrossed in a story that I tend to stick to just one. At the most I can attempt two, but even that is a rarity. I’d rather focus all my attention on one set of characters and then move on to another. Most of my reading is done at home – since I prefer peace and quiet – but I do often read on the train if I’m making a longer journey. I read books in my head but I have been won round to the benefits of reading your own work back to yourself aloud, particularly dialogue; it really helps to get the flow right. I never skip ahead on purpose. I do occasionally feel my eyes glancing to the end of a paragraph during a particularly exciting moment or the climax of a great novel, but I soon snap them back before I spoil anything. There is something hugely endearing about old, battle-worn books that show years of love and use. My compulsions push me to keep my own as pristine as I can however. I’ll just admire other people’s tatty books from afar. Never. As I said, I try to preserve my books as best I can and tend to feel that a book is for the author’s writing, not mine. but merely a life lived and loved. a spirit this pure shines brighter than any imperfection. worry abandoned like out-grown feathers. for I don’t see a fault. 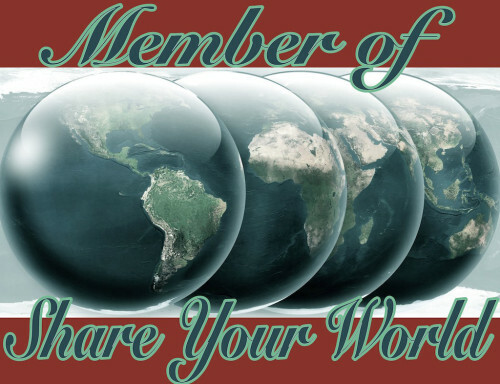 I’ve never taken part in the Share Your World series before but I have often read and enjoyed other people’s responses and decided it was about time I got involved! 1. What is your favorite smell? What memory does it remind you of? As a writer and avid reader, it may sound predictable to say that my favourite smell in the whole world is books, but it’s absolutely true. It’s like a deliciously tantalizing prelude to the wonder that’s waiting to be discovered on the pages within. It’s a hugely nostalgic smell and it definitely reminds me of my childhood. 2. Name a song or two which are included on the soundtrack to your life? This is a tough one as music is a huge part of my life. You could ask me every day and probably get a different answer each time but for now I will say All is Full of Love by Bjӧrk. The lyrics are gorgeously simplistic in their message while the song itself (not to forget its music video) manages to be simultaneously euphoric and heart-breaking. Here’s a live performance from a few years back. 3. Do you play video/computer games? Which one(s) or most recent? I’m not a ‘gamer’ per se but I do enjoy playing them. I grew up with the Resident Evil franchise so I’d probably pick it as my favourite. I’d probably say Sleepy, since sleep itself so often eludes me. As for the 8th dwarf, I’d name him Hangry (when you’re so hungry you feel angry; we’ve all been there). I’m grateful for making it to the end of the first round of edits on my WIP and am looking forward to starting to receive feedback from a beta reader. Nervous but exciting times lie ahead! to that whirlpool of decay. but the outcome – it is fated. for even the loneliest of stars shines bright. and radiate all you offer. a mere spark can birth a fire.